Moisturizing is a very crucial aspect of skin care. I love that bit. Alright. So why go for a homemade moisturizing lotion? You have sleek, smooth, great-smelling moisturizers in cute containers in the shops. But please note that those store-bought moisturizers also have loads of stuff that I personally wouldn’t want to put on my skin (to name a few – Paraffin, Paraben, Sodium Laurel/Lauryl Sulfate or Sodium Laureth Sulfate, Toluene, Dioxane). Which is why I always opt for home made products that are free from preservatives and other nasty chemicals. Plus it is fun to make your own beauty and skin care products. You should check out the following homemade beauty recipes: moisturizing sugar scrub, moisturising banana face mask, apple peel + tomato face mask, 15 Minute face mask for glowing skin, instant skin brightening trick and home made foundation powder. Let’s get straight to the recipe now. It has three (yes just 3!) ingredients. Make sure both coconut and olive oils are organic, unrefined, cold pressed ones. 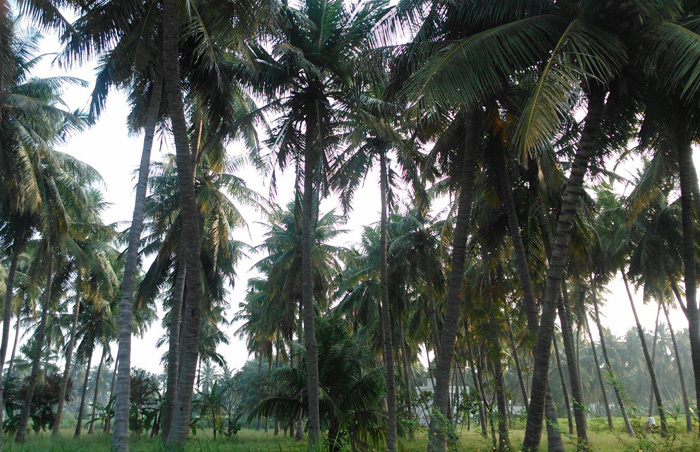 As to coconut oil I use the oil extracted (by cold pressing method) from the coconut in our farm. And you can have other optional ingredients that I talk about later. But this is the basic recipe. 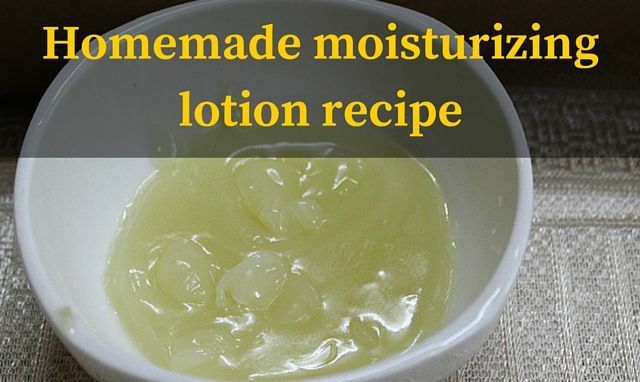 Two main benefits of this homemade lotion recipe are – it takes only 3 ingredients, and you can customize it the way you want by adding more ingredients. In my area coconut oil is in liquid state. If yours is in solid state you might have to warm it a bit to liquefy it. Grate about 1/2 tablespoon of beeswax. Boil some tap water in a saucepan. 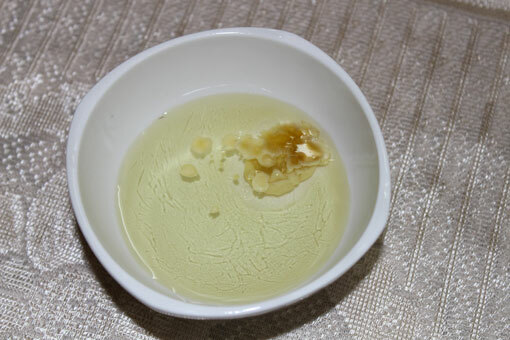 Take the grated beeswax in a metal dish and let it float on the boiled water. Meanwhile, in a dish, mix 4 tablespoons of coconut oil and 2 tablespoons of olive oil. 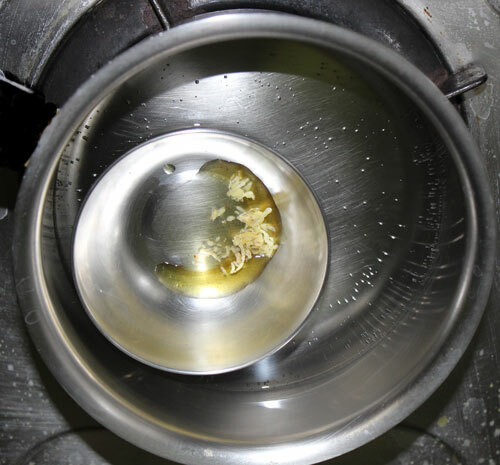 Remove the metal dish (with beeswax in it) very carefully and add it to the oil mix. Using a clean spoon stir the ingredients together. 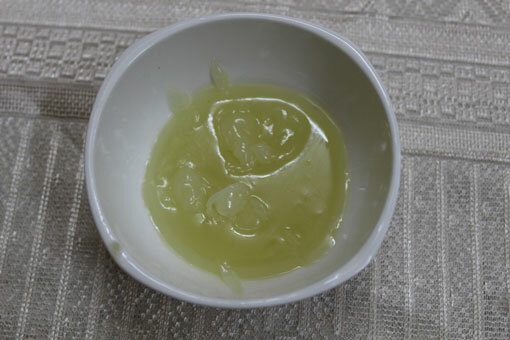 You will find beeswax to solidify in bits and pieces and will not blend together. Now transfer the contents to the metal metal dish and let it float in hot water. Hold the dish with one hand and keep stirring with a spoon using your other hand. 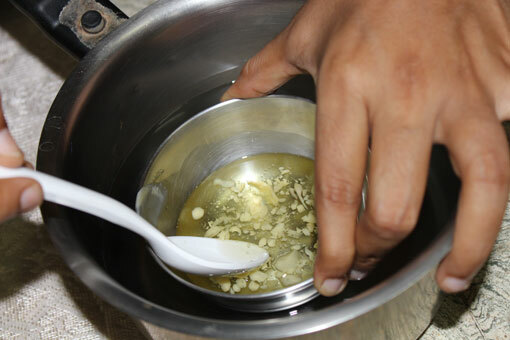 Once the beeswax and all the ingredients have mixed well remove the dish from hot water and keep stirring. Miraculously at one point you will find the lotion to lose its liquid consistency and get to a lotion-y consistency. Patience is the key here. Once you get the desired consistency transfer the lotion to a small container and use regularly. The shelf life of this lotion is pretty long since no water is added. So you should be fine to use this lotion for 2-3 months, if kept outside the fridge. It could stay even longer, but I haven’t experimented. I usually only makes small batches since the process is not so tedious and is fun as well. How to use your homemade lotion? Well, I always love to apply a moisturizer after shower. But since I mostly also shower in the evenings I don’t want to put commercial moisturizers at that time since I have to leave it on my skin overnight. This moisturizer, however, is great for that purpose. And you can leave it on your skin overnight without worrying about clogging your pores. And the beauty of this moisturizer is that it gets absorbed by the skin quite soon, so you won’t find it greasy or oily. But your skin will remain well moisturized for a long time! As you can see, the uses are really a lot. And, remember a little goes a long way. You don’t have to slather the lotion on your skin. As you can see, the ingredients are pretty much basic. Coconut oil is something I use for a variety of things right from cleansing to moisturizing to scrubbing and much more. I can talk all day about the benefits of coconut oil for skin and hair. It is rich in anti-oxidants, and is anti-bacterial, hence protects your skin. It has rich moisturising properties, hence it makes the main ingredient for this recipe. Olive oil is something I use to soothe my skin. I use it as a moisturiser. And it helps clear dark spots very effectively. It helps skin to maintain its elasticity by keeping it hydrated. It helps in the regeneration of skin cells and hence works as an anti-ageing agent. And most of all, it doesn’t clog pores. Beeswax is not something I use regularly on a daily basis, but include in lotions and moisturizers. 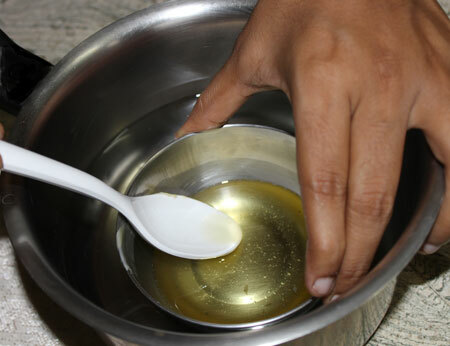 It is because it helps get the oils together to a nice consistency. It acts as a protective layer over the skin, at the same time it allows the skin to breathe without clogging the pores. It is anti-inflammatory, antibacterial and can heal and soften your skin. What additional ingredients could you add to this lotion recipe? Well, this lotion is a great moisturizer. However if you still want to up its moisturising effect, you could add a tablespoon of shea butter to the mix. If you want a little bit of chocolatey flavour, you could add cocoa butter (1 tablespoon for this recipe). Just melt it just like you’d do with beeswax and mix well. You could also add essential oils. Some worry about putting essential oils on your skin; it is perfectly fine as long as you don’t put them directly. Well diluted essential oils in very less quantities are just fine. You could add about 2-5 drops of rose, lavender, lemongrass, sandalwood or orange essential oils. However, if using on kids for diaper rash, you could avoid adding essential oils. Additionally you could add about 1/2 tablespoon of jojoba oil and 1/2 tablespoon of vitamin E oil. As I said you could experiment with a lot of variations to try out different levels of moisturizing effect and different kinds of flavours. 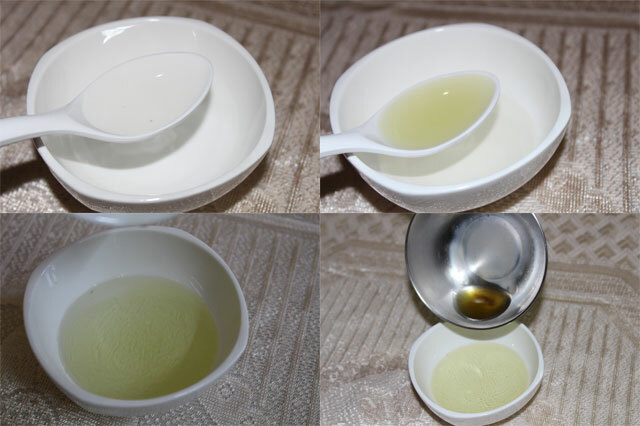 Don’t forget to try out this homemade natural face moisturizer recipe and feel the difference – after all it is so simple to make! Jane…Nice recipe… Planning to try soon.. Please let me know the place to buy good bees wax in India.